I was brought up in a Cantonese family with soup for every dinner without fail. Lotus root soup with pork is the best among a variety of soup served by my mother. Over the years, I have tasted many variations of lotus root soup, but none of those can beat the time-tested traditional lotus root soup prepared with lotus root, pork ribs, and groundnuts. In this article, I will share with you how to prepare this marvelous Cantonese style Lotus Root Soup in detail. 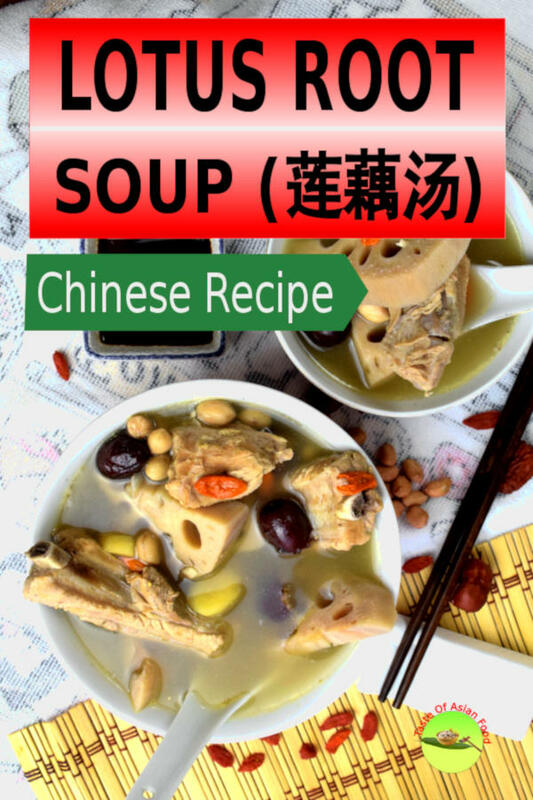 Lotus root soup with pork ribs and groundnuts (排骨花生莲藕汤) is a light, healthy and delicious Chinese soup. The taste is unique due to the combination of ingredients. It is also an easy recipe which only involves a few components. Lotus root that is more starchy tastes excellent for making soup, whereas those more crunchy types are best for lotus root stir fry. Those which is starchy has a darker color and rougher surface. The more crunchy types are lighter in color and smoother. Purchase lotus roots that feel heavy when holding and without soft spots on the surface. Wash the lotus roost with water thoroughly as it may contain some muds from the market. (It is a root vegetable!). Lotus root has a sweet flowery aroma and a refreshing taste that perfectly paired with pork and peanuts. The lotus root will turn soft after stewing, starchy and lost part of its crunchiness but will not turn mushy as the overcooked potatoes. Pork ribs are my choice because it delivers a more wholesome flavor than bone or meat alone. However, you can use pork loin alone. For those who do not eat pork, substitute it with chicken breast meat plus some chicken bones. You can either retain or remove the skin (shell coat) of the peanuts. The decision is personal as the skin will not affect the flavor of the soup. There is a small difference though. The soup will have a beautiful color due to the presence of the skin. Remove the skin if you prefer a clearer soup. Goji is available in dry form from the Chinese grocery shop and the Chinese Medical Hall. It has a slightly sweet taste and a light, clean flavor. It is widely used in Chinese culinary and Chinese medicine for a variety of illnesses. Red dates impart a sweet taste to the soup. It is usually sold in the dry form. You can purchase red dates from the Asian grocery shop or Chinese medical halls. The flavor of soup comes from the ingredients, which are aplenty for a pot of soup in my opinion. You only need some basic seasoning to boost up the flavor. Salt and pepper are all you need. Use only ground white pepper, not black pepper to get the authentic taste. Alternatively, add a teaspoon of white peppercorns to the soup during stewing. You may find a few more ingredients in other similar recipes. Dry cuttlefish (吊片), dry scallop (干贝) and dry sea snail slices (螺片) are popular addition as they furnish the soup with a powerful umami lift. You only need to add two dry cuttlefishes in this recipe, and it will boost the flavor significantly. You can get all these at the Chinese dry marine store in Asia, although I am not sure if these are available easily in other places. Therefore, I put these as the optional items in the recipe. Garlic. I have watched a Chinese chef adding sauteed garlic clove to the soup. I am not sure if this will turn out well in my recipe since his version is without peanuts. Because of this, I do not recommend adding garlic to the lotus root soup with pork ribs and peanuts. Sweet corn. 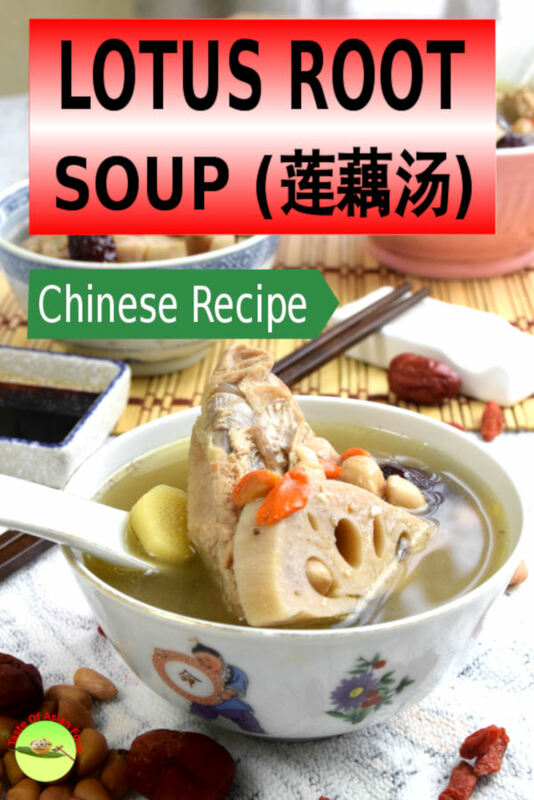 There are various Chinese soups include sweet corn in the recipe for its sweetness and clean flavor. My family recipe does not include sweet corn. 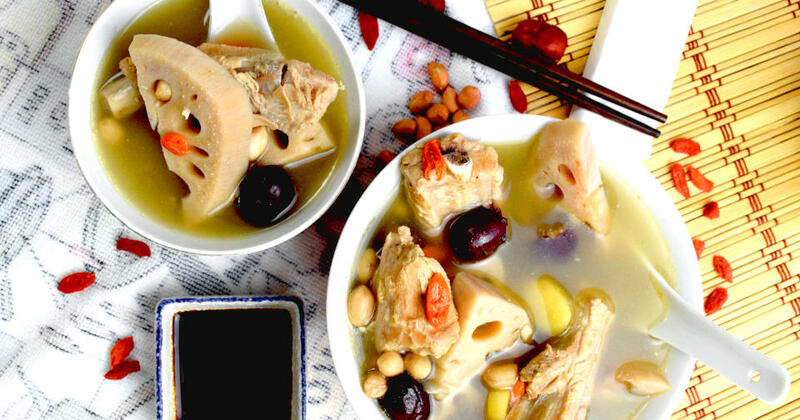 We think that the flavor of pork ribs, peanuts and lotus roots are the triumvirate of the lotus soup. That is the ultimate combination! Carrots. You can also prepare lotus root soup with carrots, as it compliments well with other ingredients. One small carrot should be sufficient for the quantity in this recipe. Blanch the pork ribs in water. Remove when the surface of the ribs turn pale, and the water starts to boil. Do not leave the pork ribs in the water for too long as it will lose its flavor. (Two to three minutes is enough.) Place the pork ribs in cold water to have a quick wash. This pre-treatment of the pork ribs (also apply to the chicken bones and the large pieces of pork) will eliminate the unwanted raw smell of the meat due to the presence of blood and other impurities. Place the blanched pork ribs in a stockpot. Submerge the ribs in water by adding sufficient cold water, about 1 cm above the ribs. Bring the water to a boil and let it simmer for half an hour. 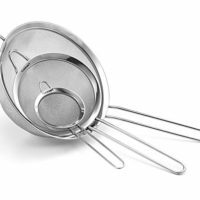 Skim off the scum on the surface from time to time with a wire mesh strainer. Clean the lotus root before cutting as it may contain some mud. Cut it into individual sections. Remove both ends of the sections. Use a vegetable peeler to peel off the skin and cut it crosswise into half centimeter thick pieces. You can cut the round pieces into half if they are too big. Lotus root slices will turn to a darker color due to oxidization. Soak the lotus root pieces in water to prevent it from changing color. Soak the peanuts in water overnight to soften it. Otherwise, the peanuts will still be slightly crunchy even after stewing for two hours. Soft peanuts are preferred for this soup. 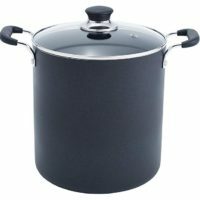 Fill up sufficient water initially so that you do not need to add more water during stewing. Add boiling water only if there is a need. Add the salt fifteen minutes before completing the cooking process. There are two reasons to add the salt at this time. First, it allows part of the salt absorb by the lotus and pork. Secondly, it is difficult to estimate the actual amount of salt required at the initial stage of stewing, as it depends on how much water is left when it is done. Adding the salt at this time (with a taste test) will ensure it is at the right level of saltiness. Add the goji about fifteen minutes before finish the cooking. Goji only needs to cook for a short time. 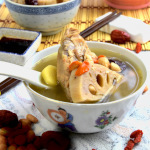 Lotus root soup with pork ribs and groundnuts (排骨花生莲藕汤) is a light, healthy and delicious clear soup. The taste is unique due to the combination of ingredients. It is also a healthy soup which only involves a few components. Blanch the pork ribs in hot water. Remove when the surface color turns pale, and the water starts to boil. Place the pork ribs in cold water to have a quick wash.
Place the blanched pork ribs in a pot. Submerge the rib in water by adding sufficient cold water, about 1 cm above the ribs. Then bring the water to a boil and let it simmer for half an hour. Skim off the scum on the surface from time to tome with a wire mesh strainer. Peel the lotus root. Cut it crosswise into half centimeter thick pieces. 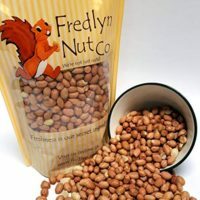 Soak the peanuts in water overnight to soften it. Soak the wolfberry until re-hydrate and plump. Add the lotus root, peanuts, red dates, white peppercorn, and ginger. Simmer over low heat for 90 minutes. Simmer for another 15 minutes, Done. 1 Response to "Lotus Root Soup – How to prepare in 3 simple steps"